What is the most efficient way to acquire rotation angles? It’s the Baumer magnetic absolute encoder series EAM580/360. Their precision is unrivalled; no product of another brand can compete in terms of robustness and longevity at this high level of absolute angular precision – though advertising might promise otherwise. The EAM580/360 magnetic encoders are at the forefront of a technology development which started at Baumer almost 20 years ago. Evidenced by numerous patents, the world's leading manufacturer of sensors and measuring instruments is co-inventor of the magnetic encoder principle. Present-day magnetic encoders nearly feature resolutions which previously were reserved to optical encoders – however, they are much more robust. «Our customers are enthusiastic. Repeatedly we have been told that Baumer EAM encoders yield significantly better measuring results than any other magnetic encoder on the market», says Katharina Blum, Product Manager at Baumer in Frauenfeld, Switzerland. Measurements in the Baumer laboratory show why: If at all, encoders from competitors comply with the data sheet specifications under ideal conditions only, but not in a demanding ambiance. «The EAM encoders ensure an angular precision of ±0.15° – which is guaranteed throughout the entire broad spectrum of specified operating conditions», underlines Mrs. Blum. 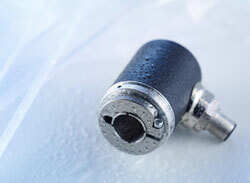 What’s the secret of the Baumer EAM encoders? It‘s the sophisticated interaction of the ingeniously arranged magnet and magnetic sensor (patent pending) in combination with a high-performant and energy-efficient microprocessor and best signal processing algorithms for conversion, filtering and interpolation of the measured values – all safely encased to withstand shocks (up to 500 g) and vibration (up to 30 g). The extra robust EAM R series provides highest corrosion resistance (CX) for applications in mobile automation (E1-compliant) and functional safety (up to PLd level). The unique and clearly structured EAM series offers the best application match in terms of dimensions, interface connectivity and product properties, both in stationary and mobile applications. Under the motto "Beyond the Standard", Baumer customers get added value without having to add money.